The Victory Eagle on the facade of the Veterans Memorial Building in Detroit is 30 feet high and projects 4½ feet from the wall in high relief. Seven free-standing pylons were originally placed in front of the building along the walkway leading to the entrance. Twenty feet high and carved with incised relief, they depict scenes from the military history of Detroit and the United States. 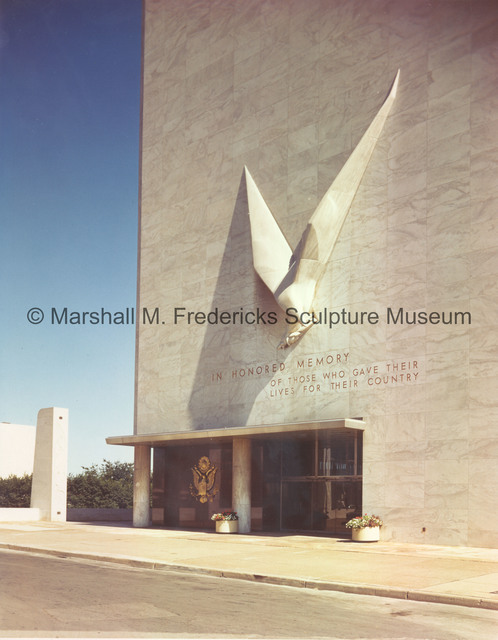 “View of "Victory Eagle (American Eagle) and pylon at the Veterans Memorial Building,” Marshall M. Fredericks Sculpture Museum, accessed April 20, 2019, http://omeka.svsu.edu/items/show/3716.